Plot Synopsis: When Communist paratroopers descend on a Colorado high school football field, a group of the school’s students — Jed (PATRICK SWAYZE), Matt (CHARLIE SHEEN), Robert (C. THOMAS HOWELL), Aardvark (DOUG TOBY), Daryl (DARREN DALTON), Erica (LEA THOMPSON) and Toni (JENNIFER GREY) — wages an all-out guerilla war to save their town and their country. 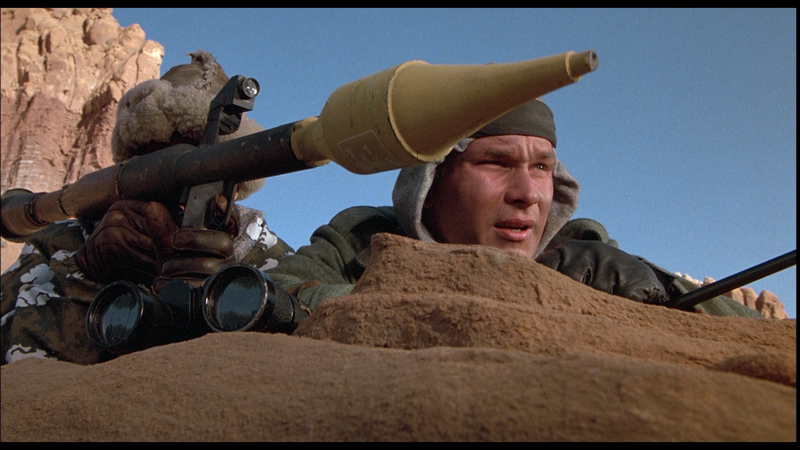 Quick Hit Review: Most certainly silly on the surface, and not terribly well written by John Milius (who also directed), Red Dawn was at least an entertaining flick with some impressive stunt work and an even more impressive 1980s cast headlined by Patrick Swayze who was great as the Dawn leader not to mention seeing Lea Thompson (Back to the Future) and Jennifer Grey (Dirty Dancing) together on screen playing a couple of tough gals. This “Shout Select” release (#13) comes with a matted slip cover. The inner cover is reversible revealing the movie’s original poster artwork (which I kind of prefer). 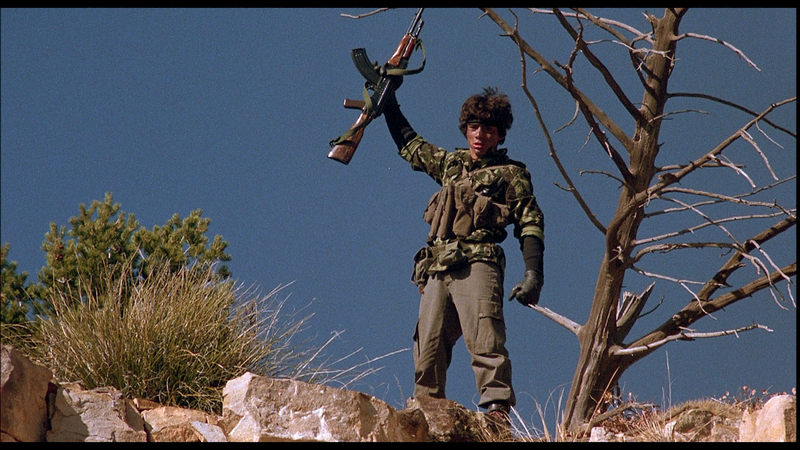 A Look Back at Red Dawn (1:09:08; HD) is a lengthy retrospective featurette that includes new interviews with a variety of folks from the casting director to actor Doug Toby amongst others. 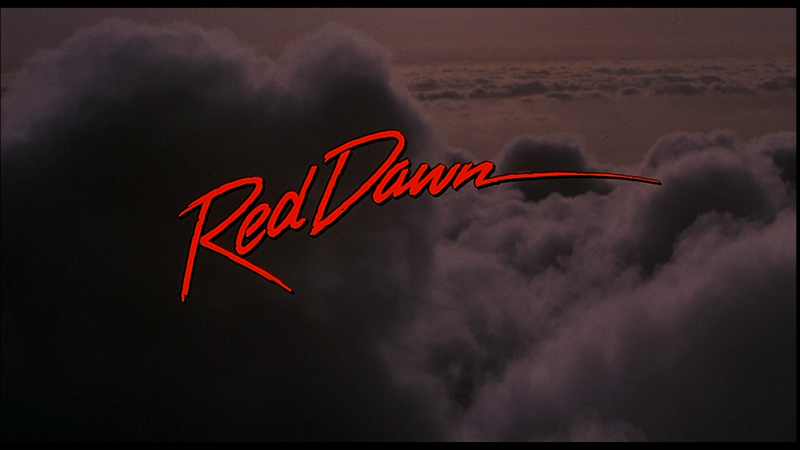 Red Dawn Rising (23:02; SD) – This is a 2007 featurette with archival interviews with the cast (Patrick Swayze, Charlie Sheen, Lea Thompson, C. Thomas Howell, Powers Boothe) and writer/director John Milius. Presented in full frame. Training for WWIII (9:49; SD) – Another old featurette from 2007 with interviews by the cast on their weapons and tactical maneuvering. Building the Red Menace (9:37; SD) is about the Russian army villains; includes interviews with the director of photography, the tank designers and some behind-the-scenes footage. WWIII Comes to Town (13:27; SD) – This archival featurette covers the small Colorado town (which in reality was Las Vegas, New Mexico), revisits some of the locations and interviews locals. 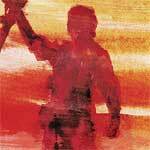 Red Dawn parachutes onto Blu-ray through Shout Factory’s “Shout Selection” line of titles and is presented in the film’s original 1.85 widescreen aspect ratio and given a respectable, albeit not flawless, 1080p high-definition transfer. First, the picture quality isn’t bad: detail looks decent and colors appear natural looking and not getting a boost. However, I did tend to notice the occasional scratch marks or dust so it’s not exactly pristine. But with the movie going on 30+ years now, it’s not altogether bad. As with most Shout releases, this comes with both a 5.1 and 2.0 DTS-HD Master Audio tracks and while I watched the film mostly with the former, I did test the 2.0 option and you can’t go wrong with either one. The 5.1 track does offer slightly more depth but crisp and clean dialogue levels. 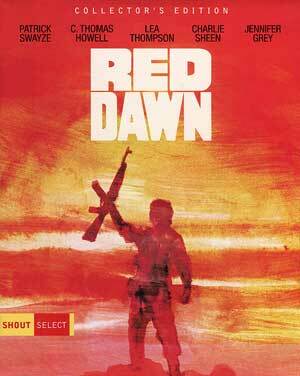 Overall, this 1984 Red Dawn is no doubt a silly movie with Cold War fear-mongering at the forefront, but I’d be lying if I didn’t have fun watching especially with this who’s who cast from the era top lined by Patrick Swayze and Jennifer Grey years before they’d hit it big with their iconic movie, Dirty Dancing. The Blu-ray released by Shout Factory includes good video/audio transfers and an okay selection of bonus material.